Liverpool edged past Portsmouth to reach the FA Cup fifth round. 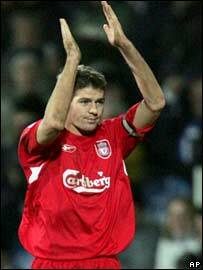 The win was set up by a fortuitous penalty award - Dejan Stefanovic harshly penalised for handball - which allowed Steven Gerrard to shoot home. John Arne Riise netted Liverpool's second on 40 minutes by firing past keeper Dean Kiely from an acute angle. Early in the second half Portsmouth pulled a goal back, Sean Davis flicking a header past keeper Jose Reina, but Liverpool held on in a tense finale. Portsmouth packed their midfield in the opening period, opting to play Vincent Pericard as a lone striker with the aim of disrupting Liverpool's midfield. The plan achieved its aim but also had the consequence of delivering a very scrappy game in a disappointing opening. It took 25 minutes before either keeper was seriously tested - Reina reacting quickly to save a dipping effort from Pedro Mendes. At times Portsmouth's committed approach went too far and Pericard, Richard Hughes and Davis were all booked for ugly tackles. Former Red Gregory Vignal also appeared to lead with his elbow in going for the ball with Steven Gerrard. On 35 minutes Liverpool went ahead after Stefanovic was harshly penalised when the ball ricocheted onto his hand as the Portsmouth captain tried to clear a corner. Kiely, making his debut following his move from Charlton, guessed which way Gerrard took the penalty, but the Liverpool captain's shot was hit with too much power and accuracy. Five minutes later Riise scored a superb individual goal. The Norwegian collected Fernando Morientes' flick and sprinted towards the Portsmouth box before arrowing a diagonal shot past Kiely. Portsmouth manager Harry Redknapp brought on Svetoslav Todorov at the start of the second half to try and provide Pericard with more support in attack. Todorov's introduction had the effect of revitalising the Portsmouth attack. And on 54 minutes Portsmouth hauled themselves back into the game when Davis got in front of Jamie Carragher to head past Reina following Gary O'Neil's free-kick. Portsmouth continued to unsettle Liverpool from a series of set-pieces, their best effort a curling shot from Stefanovic. Late on Todorov's cross from the left eluded Reina, who was relieved to gather the ball at the second attempt, but Liverpool's defence held firm. Liverpool's best chance in the second-half fell to Riise just after the Davis goal, but the Norwegian skied his shot over the bar. Portsmouth: Kiely, Primus (Priske 88), Stefanovic, O'Brien, Vignal (Todorov 45), O'Neil, Davis, Pedro Mendes, Hughes, Taylor, Pericard (Karadas 66). Subs Not Used: Ashdown, Cisse. Liverpool: Reina, Kromkamp, Hyypia, Carragher, Warnock, Gerrard (Finnan 80), Alonso, Sissoko, Riise, Cisse (Kewell 83), Morientes (Crouch 72). Goals: Gerrard 37 pen, Riise 41.